Personalize your coloring experience with wonderfully-drawn letters and numbers to arrange in countless ways. Exotic Alphabet includes one complete upper case alphabet, one set of numerals 0-9, common punctuation marks, and one complete lower case alphabet that coordinates with the upper case letters. 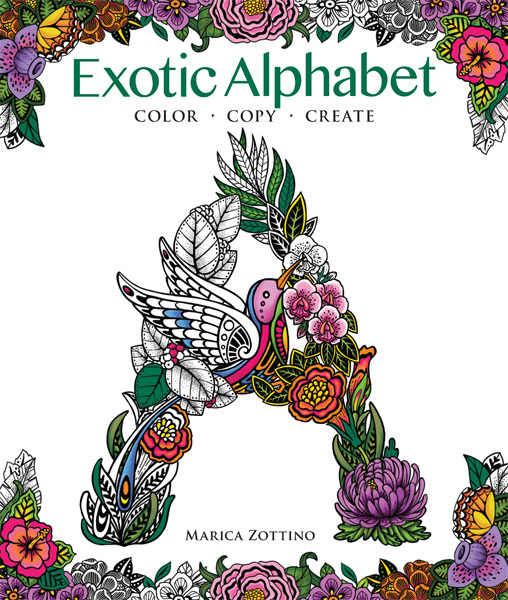 Each character is drawn in Marica Zottino's signature style, using lovely flora, fauna, and intricate patterns to make up each letter or number. Color each character and arrange into monograms to personalize decorations and gifts.